Tolex, a breakthrough in both micro-finishing sanding and dry lubrication process technology, results in a system that allows true topcoat sanding without the use of water. Thanks to the blocking effect of the Tolex pad, dust and nibs can now be located and removed faster than ever. 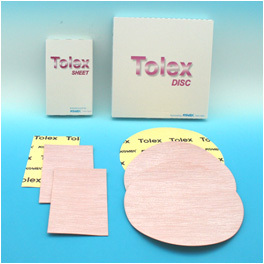 With speed like dry sanding and finishes like wet, Tolex scratches are extremely uniform and shallow, they can be easily removed by light compounding or with our Buflex system. If you are concerned with your topcoat finishing but prefer not to wet sand, the perfect system is finally here!